Two roads diverged in a wood, and I, I took the one that was tougher and hillier; not quite Robert Frost, but a good description of the type of athlete I have always been; the type who likes to take on challenges. If there are two hills to climb, I want to climb the tougher one, if there are two routes to ride, I will always pick the longer one. I don’t shy away from things just because they are challenging; or at least I didn’t until I found out I was having a baby. 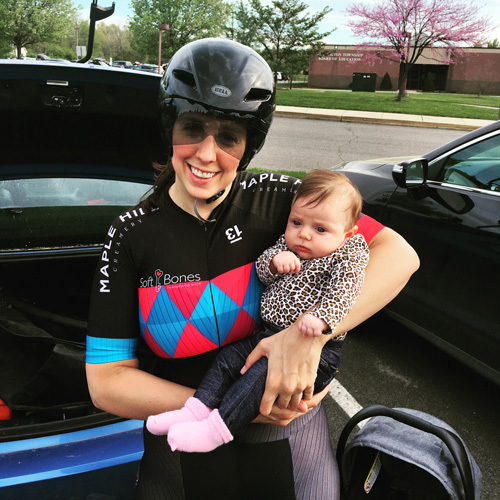 Once I became pregnant I knew that if I wanted to continue to ride during my pregnancy, I had to pick the easier climb, the shorter route, the less challenging option. I understood that I was going to have to take it a bit easier, and I was ok with that because I knew it was temporary. I made it through the pregnancy and the recovery afterward and was anxious to get back out on my bike. However, I found that I was now, for the first time, feeling intimidated by the challenges that I used to face head on. I didn’t feel like myself. 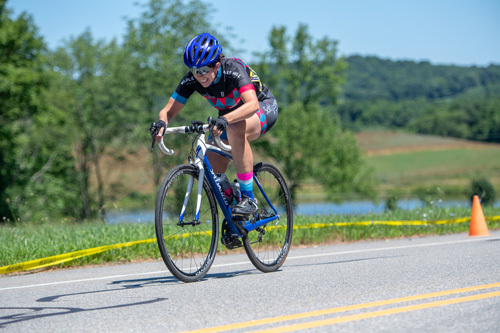 Who was this nervous girl who was afraid to take on tough rides and tackle big climbs? I was afraid that I would never get back to riding the way I did before. I knew it was silly to be scared, because of course, the only way to get back to being the athlete I wanted to be, was to really challenge myself again. Nevertheless, I continued to shy away from pushing myself. I was racing again, but more timidly and without much success and in my training I had no real focus. Many days I found myself pedaling around aimlessly which was not fulfilling. I felt like I was losing the joy that cycling used to bring me and I wasn’t sure how to get it back. After a couple of months of aimless pedaling, one day, something inside of me shifted and I decided that enough was enough. Even if I was a bit heavier and slower, I needed to climb big hills again and ride those longer more difficult rides. I remembered that my joy in cycling was derived from conquering challenges and just spending hours and hours outside on my bike. Instead of feeling nervous and bailing out when things got tough, I started to feel excited again. I noticed that I was feeling stronger with each challenge I faced. One thing that’s true in life and athletic endeavors is that if you never push yourself outside your comfort zone you will never progress. In training, if you never take your body to the point where it hurts and you want to quit, you will never get stronger or better or faster, you will just stagnate. This is something I knew innately, but seemed to have forgotten for a little while. In the spirit of this, I recently decided to sign up for the Estremo option for next year’s New Jersey Gran Fondo. This will be the longest ride I have ever done, at one hundred and twenty-five miles in length and with nearly ten thousand feet of climbing. It’s almost a year away, in September of 2019, but I am now feeling motivated to train and excited to take on the challenge when the time comes.